Can x_hmrqst be omitted from back up before upgrading LANSA? Can host monitor files be omitted from backing up before upgrading LANSA for i? Can x_hmrqst be omitted from backing up before upgrading LANSA for i? Host monitor files store the connection details of each bit of work of the Visual LANSA slaves that connect to an IBM i master. These files are contained in subdirectories under the x_hmrqst directory on the IBM i IFS. When upgrading LANSA for i, it is a vital step to back up your system before commencing so that it is easy to restore if any issues are faced. While backing up is an essential task, it can be time consuming when there are large quantities of directories and files to be backed up. Can x_hmrqst be omitted from your back up strategy, either via your daily/weekly back up or before upgrading LANSA for i? Firstly it is important to understand what is contained in the x_hmrqst directory. It contains subdirectories that reflect the Visual LANSA slaves that have been connected to a LANSA for i master system. These subdirectories contain files that relate to the connection information between a LANSA for i system and the Visual LANSA slaves. These files are refreshed every time the host monitor is started in Visual LANSA. If they do not exist they will be created automatically. This means that for systems that have many developers working on a single system the x_hmrqstdirectory can quickly fill up with many subdirectories, containing many files, which in turn can potentially slow down the back up process. In principle, yes, the x_hmrqst directory can be omited when backing up your LANSA for i system before upgrading. As long as you are not compiling objects out side of LANSA then there is not immediate need to keep a backed up version for an upgrade. 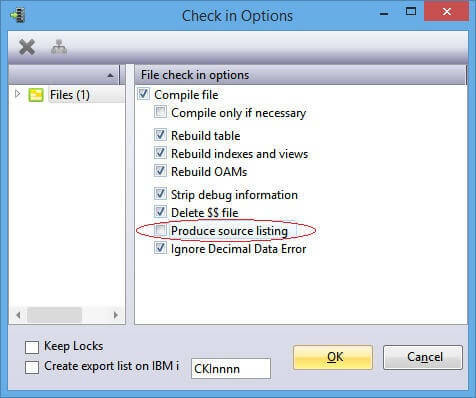 Furthermore, to prevent these sub directories from accumulating too many files in the first place uncheck the 'Produce Source Listing' checkbox when compiling and checking in objects. There is no reason to check this option if you are not compiling outside of LANSA. Note: Restoring from back up is an important step if any upgrade issues occur. If the time for the back up to run is not an issue, then including the x_hmrqst directory is advisable and should only be omitted if it is substantially slowing the time it takes to back up your system.